Giombetti Electric, Inc., is a family-owned, family-run electrical contracting firm located in Marlborough, Massachusetts. It was founded in 1975 by Donald Giombetti. Donald started with a single van and a home office, and gradually expanded the business which incorporated in 1982. Donald remains at the helm, guiding the business to the professional electrical contracting firm that it is today. 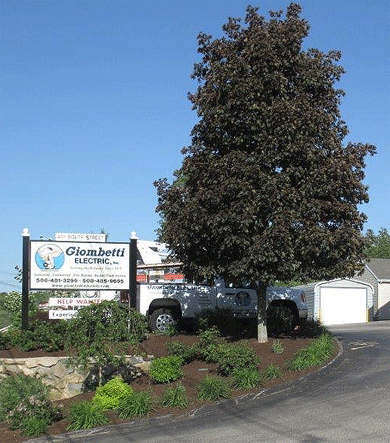 Giombetti Electric has nine fully-equipped service vans and maintains a fully-stocked warehouse on its premises in Marlboro, MA. Giombetti Electric also has a fully-stocked bucket truck that has a 46 foot working height capability. are licensed in Massachusetts, New Hampshire, and Maine. are equipped with state-of-the-art communications for prompt response to all of your needs with 24 hour emergency service. In addition to a prompt and efficient service department, Giombetti Electric has a full-time office staff of professionals ready to be of assistance to you and your project needs. In addition to participating in professional electrical and business organizations, Giombetti Electric has supported the local communities in numerous ways throughout the years. Our goal is to build upon our credibility through our standards of quality, professionalism and determination to be the best in the electrical contracting field.